But, only for a limited time! Get them before they're gone!! These performance enhancing mints gives you the boost you need it without drinking coffee or energy drinks. When you gotta bolt, it's time to Jolt... 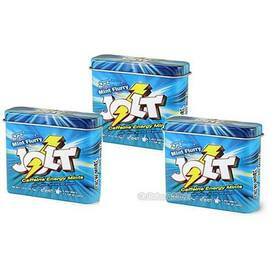 Jolt Mints, that is. Pop a few into your mouth for a refreshing mint flavor blast and an exhilarating pulse of energy! Featuring an energizing blend of caffeine, guarana, and ginseng, this unique mint is sure to perk you up any time of day.